Why would you want to run Windows 8, arguably one of the most messed up OS's per UX experts, on your beloved Mac? Because you're a web designer who's concerned about the cross-browser compatibility of your creations. Because you're concerned about your visitors (let's face it, Mac is a long way from market saturation). With Windows 8, Microsoft released another version of the infamous Internet Explorer, the tenth re-iteration of the most bashed browser in computer history. Fortunately for us, IE is beginning to conform to web standards and it's team is working hard to push past all the prejudice that the past versions earned. Against the wishes of many of the computer manufacturers, Microsoft pulled 7 out from under their feet, requiring them to accept 8. Also, IE 10 won't run on Windows 7, which means that as a web developer/designer concerned with the future, Microsoft requires you to run 8. Update 2/27/13: Over the next several weeks Microsoft is releasing IE10 for Windows 7. This is good news, but you should still check it on Win 8, as the OS can influence the look of a website. However, as a money conscious web designer, you don't want to shell out the money for a brand-new machine just to test against this new browser/OS combo. Nor can you ignore this new setup, as it's going to quickly become the new norm. Very simply put, you run the free evaluation version of 8 with the open-sourced and free VirtualBox. The evaluation version does have one limitation, which is that it will only run for 60 days. However, VirtualBox has this handy-dandy feature known as a Snapshot. Basically, it enables you to configure 8 to your needs (like installing additional browsers), take a snapshot of the setup, and restore the OS to that point when you re-start the machine. If you took the snapshot on day 1, then every time you relaunch into that snapshot, it will be day 1 again. The downside is that any files you create will be wiped when you restore the machine, making this method unusable if you want to run it as more than just a machine to test websites against. The upside is that, as long as you clear the browsers caches before you take the snapshot, you will always start with clean caches! Update 2/27/13: Microsoft released virtual machine ready disk images! This makes it super-duper easy to use and nullifies the instructions below. Jump to over to virtual tools page of Modern.IE and download the version for Mac and VirtualBox. Note that you will have to unarchive the zip file using The Unarchiver instead of Mac's default archive manager. Then, open the unzipped file with VirtualBox and you're all set up! 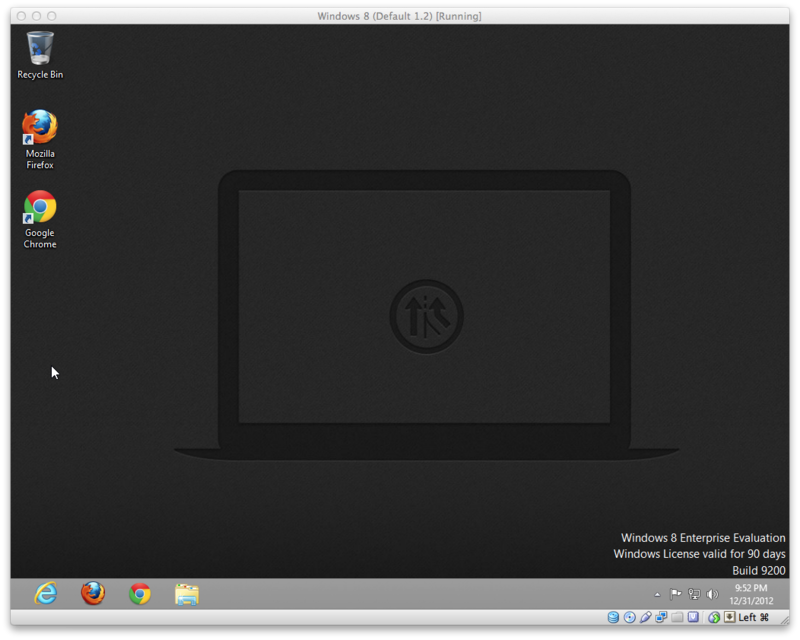 Download, install, and launch VirtualBox. Begin the download of the Windows 8 Enterprise evaluation. It's over 3GB, so it will take quite a while. Also, Windows requires you to have a Microsoft account and a Java applet before you can download anything (Annoying, huh? Since when did you have to have a plugin to download a file!). In the dialog that pops up, enter a name for your virtual machine, in this case Windows 8 with the type set to Microsoft Windows and the version to Windows 8 (64 bit). Hit the continue button. Now, select how much RAM you want to allocate to the virtual machine when it's running. Remember that however much you specify will be "stolen" from your local machine while the VM is running. With Window 8, 2GB is the recommended miniumum. The more you chose, the faster your VM will run, at the cost of your host OS. Don't select over half of your entire installed RAM or your system may crash (unless you have a lot of memory installed). On the next dialog, chose "create a virtual hard drive now". Hit the "create" button. Chose "VDI" as the type of file for the virtual hard disk. Select "Dynamically Allocated" in the next dialog. In the "file location and size dialog", leave the name as Windows 8 and chose the hard drive size, based on your needs. Windows 8 won't run on less than 17GB, and VirtualBox recommends 25GB. 20GB is enough to install Firefox and Chrome, and still leave enough room for the system. Click "create" and you've built your VM! However, you still need to assign the .iso image to it, or it won't boot. Move the downloaded Windows 8 evaluation version to the Windows 8 folder that VirtualBox creates (Macintosh HD/Users/Username/VirtualBox VMs/Windows 8/). Important: One oddity of the Windows 8 Enterprise evaluation is that the downloaded file has no extension, even though it is an .iso. To get VirtualBox to see it, you have to add the .iso suffix to the end of the filename. Once again in VirtualBox, click on the new Windows 8 virtual machine in the sidebar. Go to Machine>Settings in the menubar, and navigate to the Storage tab in the resulting window. Select the disk under Controller: IDE. Under the attributes information on the right side of the window, click on the cd icon. Pick Chose a virtual cd/dvd disk file from the drop down. Navigate to the location of the Windows 8 .iso file and select it. Dismiss the dialogs, pick Windows 8 from the VirtualBox sidebar, and click start. Windows 8 will launch in a new window, work your way though the OS setup and installation, install any extra browsers you need, create a snapshot (Machine>Take snapshot) and viola, you have Windows 8 and IE 10 running on your Mac for free!